ORICO AC52535-1S 5.25 inch to 2.5 & 3.5 inch Hard Drive or SSD Mounting Bracket Converter Adapter with Aluminum Construction offer Excellent HEAT Dispersion & SHOCK Absorption . Available in Black and Silver . 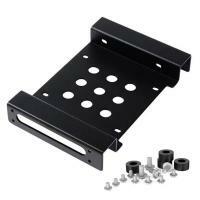 Allow to mount a 3.5 inch Drive and a 2.5 inch Drive to a 5.25 inch Driver Bay in your Computer Case easily with 16PCS Mounting Screws and 4PCS Rubber Washer in the Box , Fit for both 3.5 inch & 2.5 inch IDE , SATA or SAS Hard Disk Drive and Solid State Disk . Fit in Standard 5.25 inch Driver Bay . 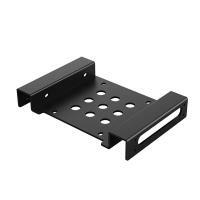 If you wanna update Super Speed SSD for your Computer or wanna add 3.5" or 2.5" Drives for your Computer , ORICO AC52535-1S Aluminum Mount Bracket will be an Ideal Solution for you.